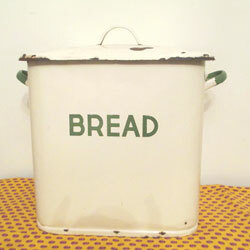 Still perfect for its original use, this early 1900s enamel bread bin can store your bread, crackers, chips, etc. With just the usual enamel chips on the lid, it is in very good condition, both inside and outside. It's white with green lettering and trim. 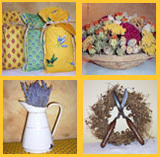 The dimensions are 14 1/2 inches to the top of the lid, 16 inches from handle to handle and 9 inches in width. In the shop we have several other bread bins. Please contact us for details.